Ungulates, or hoofed mammals, are members of the orders Perissodactyla (odd-toed ungulates) and Artiodactyla (even-toed ungulates). Ungulates include most of the large land mammals on earth. Ungulates are found naturally on all continents except Antarctica and Australia (where they were introduced by humans) and in almost all land environments from forests to grasslands to deserts to high mountains to the tundra. They range in size from the Lesser Malay mouse deer (Tragulus javanicus) which weighs 1.5 to 2.5 kg (3.3 to 5.5 lbs) to the white rhinoceros (Ceratotherium simum) and the hippopotamus (Hippopotamus amphibius) which can weigh over 3,200 kg (7,000 lbs) (Huffman 2006). 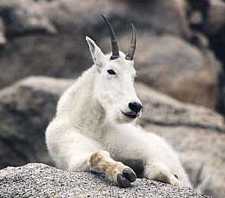 Ungulates are tremendously important to humans. From earliest times they have been widely hunted for food. Some species have played important roles as domesticated animals, providing food, fiber, transportation, and many other benefits. Important domestic ungulates include sheep (Ovis aries), goats (Capra hircus), pigs (Sus scrofa), cattle (Bos taurus), buffalos (Bubalus bubalus), horses (Equus caballus), donkeys (Equus asinus), camels (Camelus dromedarius and C. bactrianus), llamas (Lama guanicoe), and reindeer (Rangifer tarandus). Many of the even-toed ungulates have developed a symbiotic relationship with microorganisms. Through this mutually beneficial relationship, the mammals are able to digest cellulose into a form of carbohydrate they can use, as well as other digestive benefits, while the microorganisms receive food and shelter. The word "ungulate" comes from the Latin word ungula, meaning "hoof." A hoof is a claw or nail that protects the toe and enables it to support the weight of the animal. Ungulates stand and run on the tips of their toes. Most of the weight is supported by the hoofs, with the result that the form of locomotion of ungulates is described as "unguligrade" (rather than "digitigrade," where the toes touch the ground, or "plantigrade," where the entire foot is on the ground, as in humans) (Huffman 2006). This plus modifications in the bones of the legs lengthen the legs, which provides for faster running. It is thought that the ungulates evolved on grasslands where the ability to run quickly is of vital importance in escaping predators (UCMP 2006). Most ungulates are herbivores, eating plants. Some are grazers, eating grass, and some are browsers, eating leaves of trees and other plants. Many ungulates have large, complexly grooved molar teeth to grind their food. In most, the canine teeth are reduced. A few ungulates, such as the pigs, are omnivores, eating both plant and animal foods. In the Perissodactyla, the odd-toed ungulates, the central axis of the foot passes through the third toe. In rhinoceroses, the first and fifth toes are lost and the animal walks on the remaining three toes. In horses, only the third toe remains and supports the whole weight of the animal. Tapirs have four toes on their front feet and three on their hind feet. The odd-toed ungulates arose in what is now North America in the late Paleocene, less than 10 million years after the dinosaurs died out. By the start of the Eocene (55 million years ago), they had diversified and spread out to occupy several continents. 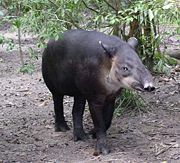 The horses and tapirs both evolved in North America; the rhinoceroses appear to have developed in Asia from tapir-like animals and then spread to the Americas during the middle Eocene (about 45 million years ago). There were 12 families categorized from the fossil record, of which only three survive. These families were very diverse in form and size; they included the enormous Brontotheres and the bizarre Chalicotheres. The largest perissodactyl, an Asian rhinoceros called Paraceratherium, reached 11,000 kg (12 tons), more than twice the weight of an elephant. Perissodactyls were the dominant group of large terrestrial browsers right through the Oligocene. However, the rise of grasses in the Miocene (about 20 million years ago) saw a major change: the even-toed ungulates with their more complex stomachs were better adapted to a coarse, low-nutrition diet, and soon rose to prominence. Nevertheless, many odd-toed species survived and prospered until the late Pleistocene (about 10,000 years ago) when they faced the pressure of human hunting and habitat change. Today, there are only 19 species of odd-toed ungulates still living and all of them are in danger of extinction except for the horse and the donkey, which have been domesticated (UCMP 2006). 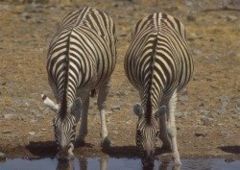 Equidae – Horse family (horses, donkey, zebras, onager). Africa, Europe, and Asia. 9 or 10 species. In Artiodactyla, even-toed ungulates, the axis of the leg passes between the third and fourth toes. The weight of most even-toed ungulates is born evenly on the third and fourth toe of each foot with the other toes being absent, or vestigial in the case of most deer. Hippopotamuses and pigs have four functional toes on each foot (Nowak 1983). Except for hippopotamuses, peccaries, and pigs, all even-toed ungulates digest their food by the process of rumination. Their stomachs are divided into chambers, three for camels and mouse deer and four for the other families (Nowak 1983). After food is swallowed, it is kept in the first chamber for a while where it is partly digested with the help of microorganisms, bacteria, and protists. In this symbiotic relationship, the microorganisms break down the cellulose in the plant material into carbohydrates, which the ungulate can digest. Both sides receive some benefit from this relationship. The microorganisms get food and a place to live and the ungulate gets help with its digestion. The partly digested food is then sent back up to the mouth where it is chewed again and sent on to the other parts of the stomach to be completely digested. The microorganisms themselves are also digested, providing proteins and other nutrients, but not before the community of microorganisms has had a chance to reproduce and give rise to a new generation so the relationship can continue (Lott 2003). The process also generates heat, which can help to keep the ungulate warm, and breaks down plant toxins, which permits plants that are poisonous to other animals to be eaten (Voelker 1986). Many even-toed ungulates have horns or antlers. As with many mammal groups, even-toed ungulates first appeared during the Early Eocene (about 54 million years ago). In form, they were rather like today's chevrotains: small, short-legged creatures that ate leaves and the soft parts of plants. By the Late Eocene (46 million years ago), the three modern suborders had already developed: Suina (the pig group); Tylopoda (the camel group); and Ruminantia (the antelope group). Nevertheless, artiodactyls were far from dominant at that time: the odd-toed ungulates were much more successful and far more numerous. Even-toed ungulates survived in niche roles, usually occupying marginal habitats, aided by their complex digestive systems, which allowed them to survive on lower-grade feed. The appearance of grasses during the Eocene and their subsequent spread during the Miocene (about 20 million years ago) saw a major change: grasses are very difficult to digest and the even-toed ungulates with their highly-developed stomachs were better able to adapt to this coarse, low-nutrition diet. They gradually replaced the odd-toed ungulates as the dominant terrestrial herbivores. There are over 200 species of even-toed ungulates living today. 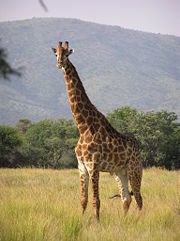 Some are endangered due to hunting and loss of habitat. On the other hand, many species are doing well and some have expanded their ranges due to being introduced to new locations by humans. Suidae – Pigs. Africa, Asia, and Europe. Tayassuidae – Peccaries. North and South America. Camelidae – Camels, llamas. Africa, Asia, and South America. Tragulidae – Mouse deer or chevrotains. Africa and Asia. Cervidae – Deer, elk, moose. North and South America, Europe, Asia, northern Africa. Moschidae – Musk deer. Asia. Giraffidae – Giraffe and okapi. Africa. Antilocapridae – Pronghorn. North America. Bovidae – Antelope, buffalo, cattle, goats, and sheep. Africa, Europe, Asia, and North America. Huffman, B. 2007. The Ultimate Ungulate Page. Retrieved April 2, 2007. Nowak, R. M., and J. L. Paradiso. 1983. Walker's Mammals of the World. Baltimore: Johns Hopkins University Press. University of California Museum of Paleontology (UCMP). 2006. Ungulates: Hoofed Mammals. Retrieved April 2, 2007. Voelker, W. 1986. The Natural History of Living Mammals. Medford, NJ: Plexus Publishing. This page was last modified on 4 February 2009, at 02:55.